GDPR - Letterkenny Credit Union Ltd. The General Data Protection Regulation (GDPR) comes into force across Europe on the 25th May 2018 replacing the existing data protection framework under the EU Data Protection Directive. GDPR is a new law around the protection of Personal Data which seeks to strengthen and unify data protection for all individuals within the EU. GDPR grants a number of new and enhanced rights to all individuals regarding the treatment of their personal information by organisations such as Letterkenny Credit Union. These regulations will apply to any organisation that controls and/or processes data on behalf of an individual or group of individuals. Data subjects can lodge a subject access request free of charge. The previous fee associated with lodging a subject access request has been removed under GDPR. 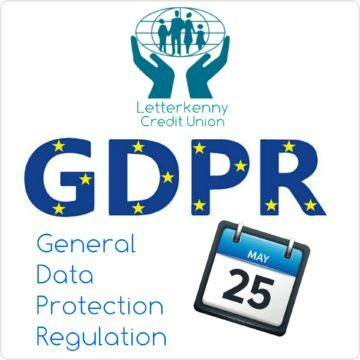 How has Letterkenny Credit Union prepared for GDPR? Letterkenny Credit Union has appointed a Data Protection Officer to oversee the transition into GDPR and act as a point of contact for members, staff and the supervisory authority. Our Data Protection Officer oversees how we collect, use, share and protect your information to ensure your rights are fulfilled. GDPR acts to empower individuals in relation to the treatment of their personal information. It increases and reinforces the rights of individuals in relation to the information we hold about them. Being transparent and providing accessible information to members about how we process their personal information is a key element of GDPR. Letterkenny Credit Union takes privacy and the protection of personal data belonging to our members and staff very seriously. We treat information belonging to our members and staff with the highest priority in terms of security and we will continue to implement this strategy going forward. Therefore, we fully support the enhancements to data protection which will be introduced by GDPR. The changes described above are purely to enhance your understanding of GDPR and to clarify your rights under the new regulations. Please take some time to read our updated Privacy Notice for more detailed information on how we use your information and your rights. If you have any questions in relation to GDPR, please call us on 0749124166 or email us at dpo@letterkennycu.ie. You have a right to a copy of your personal data held by this credit union. Therefore, you may at any time submit a written Subject Access Request to Letterkenny Credit Union by post, fax or email. The credit union will reply to your request within 1 month of receipt of the written or emailed request.